What OS to run on your Mac? Why not go OS 9 on a Power Mac? Why wait for OS X? I pity G4 users. Sure, I want the graphics, the speed, and the cool graphite case, but there is something I don't want - something that sits in a corner of the hard drive, taking up memory and slowing down your system. No, isn't a program made by Microsoft; it is made by Apple. It is called Mac OS 9. Although Mac OS 9 has some excellent features, it takes up 22-32 MB of memory, versus Mac OS 8.6, which takes only 14-18 MB. Mac OS 9 does not work well on anything below a fast PowerPC 603e. If you have a slower Mac - the x200 series or x100 series - I don't recommend it. Perhaps the new features in OS 9, like Multiple Users, Software Update, Sherlock II, and the key chain are the problems. Take them away, and you really just have a bloated Mac OS 8.6. Sure, 9's features are great, but is it worth 24 MB of RAM and over 200 MB of hard disk space just to use these few features? If you have several people using the computer, OS 9 might be a good idea so you can use the Multiple users control panel. But why not just use Apple's long forgotten product that first shipped with Performas, At Ease? It works fine from System 7 through Mac OS 8.6. I have used Macs since the 80s, and I have used almost every operating system from System 6 all the way up to 9. I have chosen my favourites very carefully, based on what is included in them, how much memory they use, etc. You may notice I recommend 7.1 for some machines. You may say, "why not use 7.0, or 7.0.1?" but there is a good reason for using 7.1. Despite some bug fixes, 7.1 is also usually among the minimum requirements for some software programs. 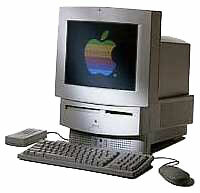 It is also the last operating system that works well with such Macs as the LC, LC II, and Colour Classic. You may also notice that I recommend 7.5 for some machines. The reason is that, while it is a more advanced operating system than 7.1, 7.5 doesn't use as much memory as 7.5.3 does, and you can still use Open Transport and programs requiring 7.5 without using as much hard disk space and RAM. For information on compact Macs, see my article What can you squeeze into a compact Mac? If you have a Macintosh II or LC with no more than 2 MB of RAM, use System 6.0.8. If you have 4 MB or more, use 7.1. Using System 7.5 slows down the computer, although 7.5 can be used if you have a PMMU and a decent amount of memory (at least 16 MB) in your Mac II. If you have an LC II, you can use System 6.0.8L, if you want to use System 6, but I like System 7.1. If you have a Performa 400, 405, or 410, it came with 7.0.1P, but you may use standard System 7.0.1 or 7.1 with no problem. You will just lose the "Performa features," like the Launcher, hidden desktop "while in background," and "About this Computer." In place of "About this Computer" you will see "About this Macintosh." There you will see "Macintosh LC" (they are Performa-ized Mac LC IIs) where the Apple logo used to be. If you have a Macintosh LC III, LC III+, LC 520, or LC 550 with no more than 8 MB of memory, you can use System 7.1 with the correct system enabler. If you have at least 8 MB, you can use 7.5. If you have 12 MB or more, 7.5.3 or 7.6.1 works fine (try to get an FPU if you will be running 7.6.1). If you use any type of Quadra, Centris, or '040/'LC040 based Performa or LC, you must use 7.1 or higher with the correct system enabler. Some came with 7.5. Although they can run 8.1, I recommend 7.6.1. For more information, see my Options for '040's. For a PowerPC-based machine, it is well worth the effort to buy and install Mac OS 8 or 8.1. Mac OS 8 provided PowerPC-native Finder support, which means that your Power Mac will run the Mac OS 8 Finder in PowerPC code, making it faster. Mac OS 8.5 or higher is totally PowerPC native, and if you have 32 MB of memory or more, 8.5 may make your Mac feel even faster than with OS 8. I recommend against 8.5 or higher if you have a Power Mac 6100 or a member of the x200 series. The exception is the 6360, which will run 8.5 with no problems. If you opt to buy 8.5, make sure you download the 8.6 update from Apple. It fixes some bugs, and even displays the system version on startup. Even though the bloated, problematic Mac OS 9 is the current Mac OS, I still hold my hopes high for Mac OS X. If it is as good as people say it is, it will become the standard in operating systems. Maybe other OSes will be built to imitate it, much like Microsoft tried to imitate the Mac OS with Windows. I think OS X is the OS that the world is waiting for.